How to jazz up a basic white-shirt-blue-jeans outfit? Take a cue from Sophie Choudry. Her Gucci belt instantly lends an edge to the outfit. Oversized sunnies and that dab of red are also working well with her entire look. Wearing prints is no easy ride. And that’s why Vaani Kapoor keeps her look simple in this off shoulder wrinkled printed dress from Self-Portrait paired with strappy black heels . Richa Chadha wore the perfect pantsuit for the poster launch of Daasdev. Wearing this one shoulder ikkat suit from Priya Agarwal Clothing, Richa looks comfy yet chic in her OOTD. Kriti Sanon’s outfit as quirky is as it can get! Styled by Sukriti Grover, she wore a denim skirt over this bling dress from RedEmpress label. She sure is giving us lessons on how to trun around a simple denim skirt into something as edgy as this! 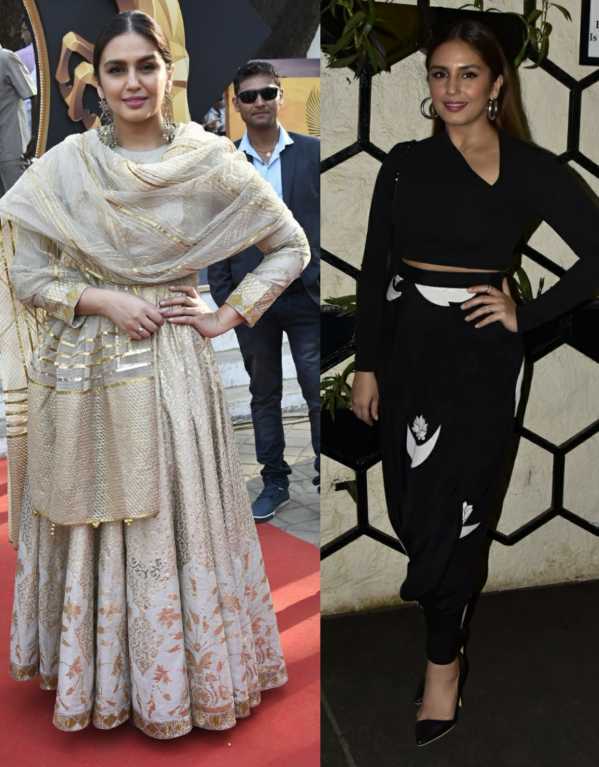 From wearing a traditional Rimple and Harpreet Narula anarkali during a day event to wearing a glam Masaba Gupta outfit for actor Varun Sharma’s birthday celebrations; she definitely knows how to work some great looks from day to night. Stunners! The mother-daughter duo made a super stylish appearance at Anamika Khanna’s LFW SS 2018 grand finale.While Janhvi looks playful in top-to-bottom embroidered outfit, Sridevi looked all glam in a pre-draped saree with embroidered jacket. Neha Dhupia aced the boho chic style with this anti-fit silhouette at Anamika Khanna LFW SS 2018 grand finale. Karishma Tanna, wearing a Payal Sighal outfit at LFW SS 2018. We want this outfit right now in our festive wardrobe! ’Coz there is nothing chicer than wearing black and white. Mandana Karimi looks like a glam goddess in this Nishka Lulla outfit. The two weeks that we’ve sat glued to our phones for updates on the Virushka wedding have finally come to an end with their grand reception in Mumbai last night. From Bollywood to the cricket fraternity, this one was star-studded in every sense! Who do you want to sign up as? Kindly enter your reason for reporting this card This card will be sent to us for review. Congratulation! Your card has been sent to your friend successfully! Would you mind taking a minute to leave us a rating?